whew, am i tired! quick post today, being out in the sun all day always makes me feel exhausted. the clinic went well, i'm a little disappointed with how i did... but was super pleased with parts, so it evens out i suppose. it was nice to get a dressage judges perspective on how i ride my test, and cool to have a little mini-lesson with her! 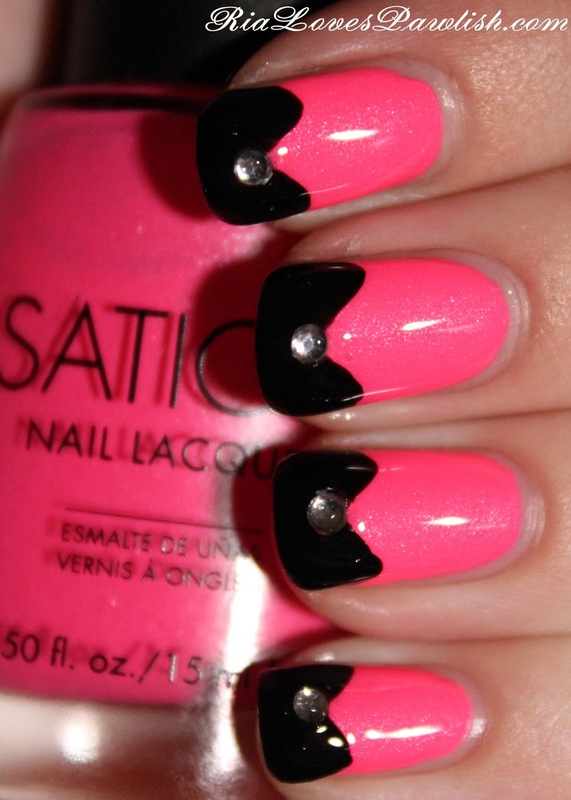 i did a little fancy pants mani for the day, a pink and black chevron French :) i used Sation Beyond Bubblegum Pink and Essence Black Is Back for the basic mani. the little crystal is from the Nail Candy Bling It On nail pen (kindly provided to me for review!). i'm still in love with how easy that pen makes applying crystals. i topped everything (including the crystal) off with a coat of Seche Vite!